The HEAT (Hildinger Engineering, Automation, and Technology) Blog covers residential technology, from HVAC to smart home tech to consumer and prosumer level tech integration. I blog about things I know work, how to make things better and occasionally about things that I found that didn't work. Unless you've been living under a rock, you know that the world of in home video entertainment (10 years ago we would have said "television") is in the process of changing completely. For a long time the subscription video services (cable, satellite, and hybrid services like AT&T's U-verse) have been bleeding subscribers by the millions. Young adults barely use traditional subscription video. YouTube entertainment, available internet streaming, and little aversion to piracy have created a demographic that just isn't interested in the bloated traditional product. Us "old guys" who can't quite believe we're not the young guys anymore, understand all of this stuff, but many of us just aren't willing to give up on being able to watch the Cowboys game in 45 minutes by time-shifting it, and the broadcasters have been very averse to letting us do that with streaming solutions, even though they KNOW it's coming. It's inevitable. There are only so many channels that Disney/ABC/ESPN can force into my bundle before we walk, and they pretty much passed that point years ago, we've just been slow to give up on things that we're comfortable with and to accept a lower quality experience in exchange for the huge savings in cash. The options have been popping up and getting stronger. First we had Netflix, Hulu, and Amazon Instant Video, then HBO got into the game with HBO Now, which was game changing and put everyone on notice. Playstation Vue, Sling TV, and now you can watch more and more of the traditional content. More and more people are finding that they can cancel their service and not look back. Meanwhile, many of us have been pacing the floor hoping that the end result would be traditional service without the bundles. Surely à la carte will be the answer and we can keep our coax cable pretty picture and ability to timeshift whatever we want, right? Apparently not. Looks like The Mouse is not going to give up their bundling power until after they've strangled that entire industry. Well, AT&T, of all people, has decided to be the one to say "This thing's over, let's put a bullet in it." Why AT&T? Well, they've always been an outsider. U-verse, their own proprietary IP TV service, let them get in the door, but really you were talking about delivering TV over copper twisted pair ADSL2+ and VDSL. It was always a limited way to deliver service and, really, not a great product. They were a 2nd tier player in subscription TV. How bad do they want this to work? Their intro pricing is simply stupid. Sign up for the big package for $35/month. 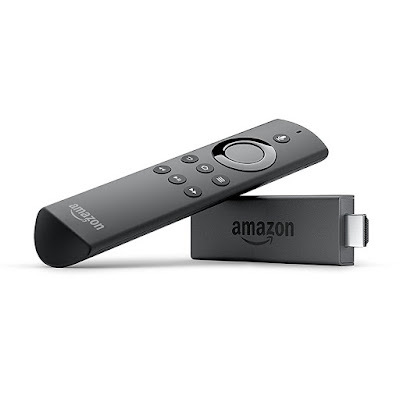 Prepay a month and they'll send you a FireTV Stick with Alexa. Prepay for 3 months and they toss in last year's 4th generation Apple TV. (hint, don't sign up for HBO and Showtime when you sign up, or you'll prepay $45/month instead of $35/month for your test drive plus device). Now, you're going to get a lot of bundled channels that you don't want, and you ARE going to need one of these streaming devices for it to work, but really, it's a stupid good deal, and a real reason to get off the fence. They're FedExing me an Apple TV as we speak. Will I keep the service? It's probably not the long term solution. The answer remains something more à la carte, but $35/month is cheap enough that AT&T is losing money, I'm sure. I would gladly let them delete 80% of those channels and still pay $35/month, though. It's going to be interesting to watch.